Midway Fire Station 9 - BCFPD - PWArchitects, Inc.
Midway Fire Station 9 kicked off the expansion of the Boone County Fire District. Completed in the summer of 2001 this station added 4 new apparatus bays and a residential living area that contains 8 sleeping rooms and a community room for use by the firefighters and the general public. With a final cost of $650,000.00 at 7,800 square feet, Station No. 9 was the largest of the most recent expansion. This station represents the full build out of the modular station concept that was developed by PWA for the Fire District. This effort was to allow the district to grow as it needed without requiring full-size station design in areas where property and population demands did not require a larger presence. Carrying through with the original design concepts established many years ago the station utilizes maintenance-free exterior materials to create a neighborhood friendly appearance and scale. 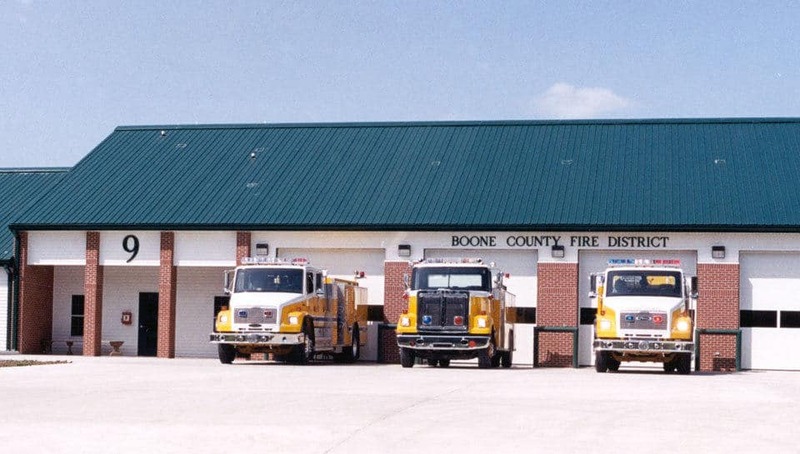 Currently, the Boone County Fire District is the largest Volunteer Fire district in the Country. We would like to think that our contribution has added to its success.